Cressleaf Groundsel in the Field. Image by Steven Smith. 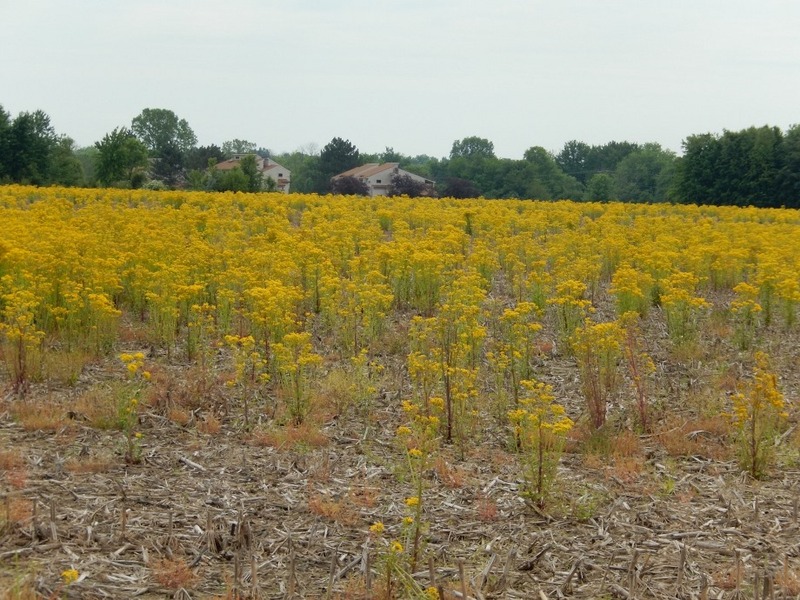 The weed that is currently gracing the landscapes and farm fields in southern Ohio with a smattering of canary yellow is cressleaf groundsel (Packera glabella). Cressleaf groundsel, which is also known as BUTTERWEED (Senecio glabellus), is a member of the aster family (Asteraceae; a.k.a. Compositae), thus the weed sports flowers that are daisy-like and seed heads that look like miniature dandelion puff-balls. The flowers are borne at the ends of thick, erect, stems that are green with reddish-purple streaks. The plant's "cress-like" leaves are responsible for the common name. Cressleaf Groundsel - Flowers. Image by Joe Boggs. Cressleaf groundsel is a native winter annual found in the northern United States. It is a heavy seed producer, and the seed can remain viable in the soil for a number of years. For reasons that are not clearly understood, this weed has become unusually common in Ohio in recent years in cultivated fields, nurseries, and landscapes. Past reports indicate the weed may have some tolerance for 2, 4-D and may require high rates of glyphosate to be controlled. Hand pulling is an effective option in landscapes, but plants must be destroyed prior to seed maturation. Cultivation prior to flower production is also effective. Both approaches will reduce future infestations. Cressleaf Groundsel - Whole Plant. Image by Joe Boggs. Cressleaf Groundsel Flowers - Seedheads. Image by Joe Boggs. Cressleaf Groundsel Seedheads w/Dandelion. Image by Joe Boggs.